The Main Unit incorporates safety, security and peace of mind. 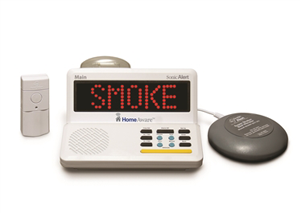 Each time a transmitter sends a signal, the alert message will scroll across your HA360MK display, such as DOOR, PHONE, etc. No matter the degree of your hearing or visual challenges, you are sure to be alerted with the 110 dB extra-loud alarm, powerful bed shaker and the large 2 inch notification alert scrolling on the display.